Traveling South on I71 – Take exit #237A (Snow Rd. East) - We are approximately 2 miles on the left/north side of Snow Rd. – Just past and across from Kaiser Hospital. Traveling North on I71 – Take exit #237 (Airport/Snow Rd.) – Turn right onto Snow Rd. 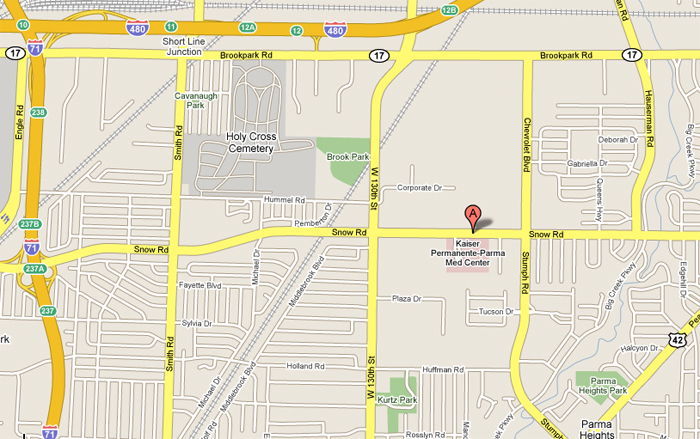 - We are approximately 2 miles on the left/north side of Snow Rd – Just past and across from Kaiser Hospital. Traveling East on I480 – Take exit #12 (W 130th - W 150th & Brookpark Rd.) Turn left/east onto Brookpark Rd. Go approximately ¼ mile to W 130th St. Turn Right/South onto W 130th St. - Go approximately 1 mile to Snow Rd. Turn left/east onto Snow Rd. – We are approximately ¾ mile on the left/north side of Snow Rd – Just past and across from Kaiser Hospital. Traveling West on I480 – Take exit #12B (W 130th St) – Turn left/south onto W 130th St - Go approximately 1 mile to Snow Rd. Turn left/east onto Snow Rd. – We are approximately ¾ mile on the left/north side of Snow Rd – Just past and across from Kaiser Hospital. Click map to go to G o o g l e maps.